Growing up in her hometown of Charleston WV, J.N spends her days wrangling her two beautiful daughters and super dog Bo and is married to her high school sweetheart, who she considers the rock that keeps her grounded to reality when she would rather be lost in the paranormal. If a book contained something supernatural there is a good chance that she has read it. Whether its vamps, shifters, elves or fairies it is most likely setting on her shelf waiting to be re-read. Looking for a new genre she found the world of romance and fell in love. The drama and conflict are different but still enough to get the adrenaline pumping and the heart thumping to keep her coming back for more. It wasn’t long until the need to write came knocking at the door and by the grace of her husband’s patience and her children’s bed times she got that chance. Her twisted mind found a new outlet on paper and now her story has found a way onto your shelf or reader and she hopes that you enjoy reading it as much as she enjoyed writing. 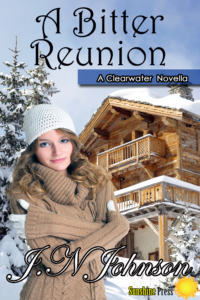 My latest release is the re-launch of A Bitter Reunion and is the second release in the multi author Clearwater Series along with Marissa Dobson, Winterbloom. I am so excited about this release because A Bitter Reunion has evolved so much over the last year since its previous release and I believe with the help of my writing partner Marissa Dobson and my out of this world editor it has become more than I thought it could be. What inspired you to write A Bitter Reunion? Last year the call for the Clearwater Series came out with these amazing town details, Marissa had created this quiet little town that was a regular Mayberry and the perfect scene for drama, isn’t it always the quiet ones who cause the most trouble. Anyways I was in Canaan Valley, WV at the time and the tiny ski town inspired Joshua and Lilly’s story, I thought to myself why would you leave such a beautiful place? If the love of your life screwed you over and your world came crashing down around you, you wouldn’t want the everyday reminders. In such a small town everywhere you look would inspire memories that would tear out your heart. Lilly decides distance is the best answer and seeks a new life away from her home, family and the person who destroyed her HEA. I am a total pantser, I have tried plotting but I tend to veer of any path I set, it usually turns out okay but sometimes it turns out great! I think for the most part my characters run the show and I am just the means to an end. As for bossy I let them play out and see what happens, sometimes I have to wrangle them in when the scenes get to hold to handle and say “whoa, we need to rethink this just a bit” but their way is usually the right way. Finding the time and quiet to write, with two little girls as perfect distractions I have to write when I can. Either when they are at school or in bed. That I like the word when. Who would have guessed that would be the four letter word I would overuse. Keep on writing, no matter how many people try to knock you down or belittle what you do just keep writing. Do it for yourself first, your readers second and your haters third! I was doing reviews for Sizzling Hot Books and fell in love with the short story romances I was reading and thought “Hey I can do this, or at least try” that’s when my first book Passionate Tides was born. My family was super supportive; they were amazing when it came time for me to send it in to the publisher and cheered with me when that phone call came! There have been so many authors who have inspired me but in the push to get published Marissa Dobson, Ann Mayburn and Kallypso Masters have given me the best advice and helped me to keep going when things looked bleak. I just finished self edits on my first paranormal story, Ravens Legacy, A Between Fire and Ice Novella. It’s my first dive into the world of paranormal and I loved the freedom that comes with it, I was able to let my imagination run wild! J.N. is giving away an E-Copy and book mark to one lucky commenter. Good luck! Contest ends May 31st.